Francium is a highly radioactive alkali metal with the atomic number 87 and element symbol Fr. Although it occurs naturally, it decays so quickly it's very rare. In fact, scientists have never had a large enough sample of francium to know what it actually looks like! Learn about the chemical and physical properties of francium and what it's used for. Discovery: Discovered in 1939 by Marguerite Perey of the Curie Institute, Paris (France). 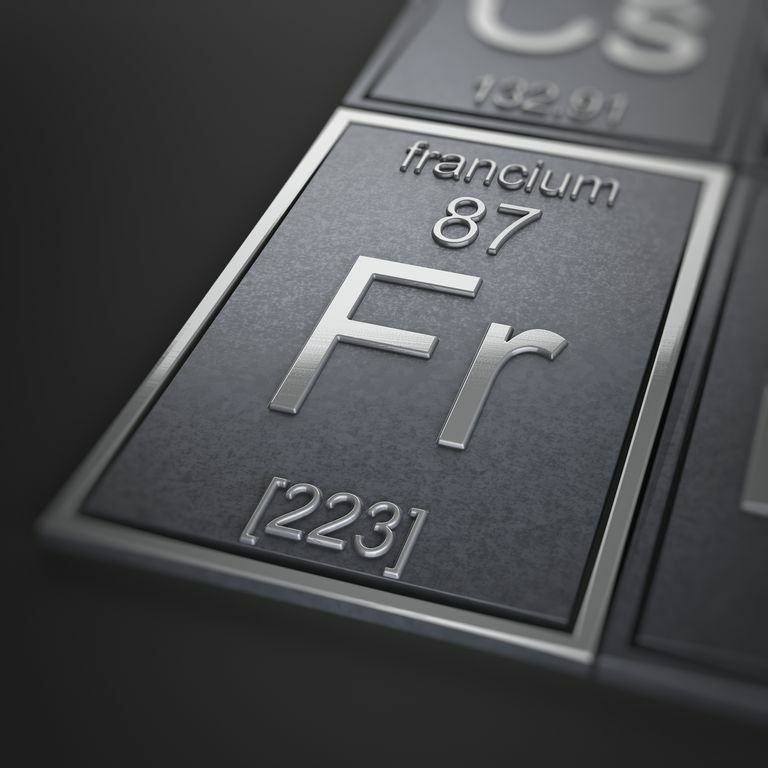 Francium was the last natural element to be discovered (others are synthetic). Word Origin: Named for France, the country of its discoverer. Isotopes: There are 33 known isotopes of francium. The longest lived is Fr-223, a daughter of Ac-227, with a half-life of 22 minutes. This is the only naturally-occuring isotope of francium. Francium rapidly decays into astatine, radium, and radon. Properties: The melting point of francium is 27 °C, boiling point is 677 °C, and its valence is 1. It is the second-least electronegative element, following cesium. It is the second rarest natural element, following astatine. Francium is the heaviest known member of the alkali metals series. It has the highest equivalent weight of any element and is the most unstable of the first 101 elements of the periodic system. All known isotopes of francium are highly unstable, so knowledge of the chemical properties of this element comes from radiochemical techniques. No weighable quantity of the element has been prepared or isolated. To date, the largest sample of francium consisted of only about 300,000 atoms. The chemical properties of francium most closely resemble those of cesium. Appearance: It's possible francium may be a liquid rather than a solid at room temperature and pressure. It is expected the element would be a shiny metal in its pure state, like the other alkali metals, and that it would readily oxidize in air and react (very) vigorously with water. Uses: Francium is so rare and decays so quickly, it doesn't have any commercial applications. The element is used for research. It has been used in spectroscopy experiments to learn about coupling constants between subatomic particles and energy levels. It's possible the element may find application in diagnostic tests for cancer. Sources: Francium occurs as a result of an alpha disintegration of actinium. It can be produced by artificially bombarding thorium with protons. It occurs naturally in uranium minerals, but there is probably less than an ounce of francium at any time in the total crust of the earth. Considine, Glenn D., ed. (2005). Francium, in Van Nostrand's Encyclopedia of Chemistry. New York: Wiley-Interscience. p. 679. ISBN 0-471-61525-0. Emsley, John (2001). Nature's Building Blocks. Oxford: Oxford University Press. pp. 151–153. ISBN 0-19-850341-5. Lide, David R., ed. (2006). CRC Handbook of Chemistry and Physics. 11. CRC. pp. 180–181. ISBN 0-8493-0487-3.